Echo Park’s beautifully curated, curiosity shop embraces a Victorian hunting lodge feel, showcasing the most unique curiosities, oddities and treasures in Los Angeles. Witness the wonder and studio experience with a Gothic edge. 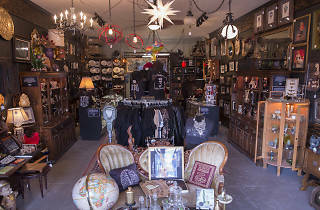 Damask walls line the shop with macabre art, vintage photography and signature insect mounts. Explore the many curio cabinets filled with skulls, candles, antiques and one of a kind gifts. Home decor for the most eclectic tastes like taxidermy, vintage clocks, lamps and accents. We promise you will enjoy your visit and find that amazing treasure you must own! We also have an on-line store and ship internationally. Coolest little shop with the best oddities. The store owners have done a great job of curating the best art, taxidermy, and other vintage, gothic, and grotesque items. I'd go in here every week if I could but would run the risk of draining my bank account. 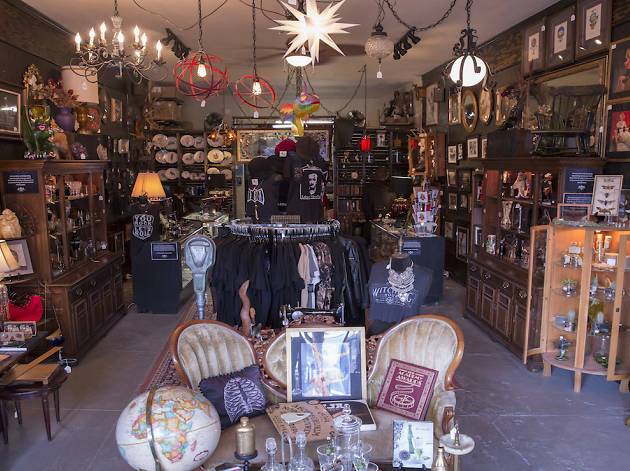 Memento Mori is the most unusual store of its kind in the entire Los Angeles area. The shop keepers, Brad & Deirdre, are incredibly knowledgeable of the many unusual artifacts they have to offer and (the best thing about Memento Mori) their art, antiques, clothing, and all the truly unique items you will find there are reasonably priced! Every single time I visit Memento Mori, I am awed by their ever-changing collection of oddities! This is THE shop for collectors of unique items, as well as THE shop to bring out of town guests to fully experience the wonders of L.A.
Mystical, magical shop. So Unique. Fascinating inventory. It's such a unique place! I never know what I'm going to find, but it's got the BEST stuff. Eclectic, unique, sumptuous shoppe filled with curios and mystery. One can find something for everyone, dead or alive, here. Its a beautiful, dark gem and authentic in every way, much like the lovely couple who curates and owns the joint. A great place to find rare and interesting objects, and they have taxidermy classes!!. The owners are so friendly and talented. So unique! The best owners and the best stuff! We love this place!! Unique, with very rare and special items. I enjoy shopping at Memento Mori. Get lost in a Victorian hunting lodge full of curiosities and incredible treasures to adorn your home. This shop is an experience not to be missed. New and old but all fits the aesthetic of remembering death...Memento Mori. Great prices, non pretentious and warm, helpful service greets you every time.